The rough translation of these phrases tells about the wishes of a determined person who asserts that he would rather love to be broken than to give up. He goes on telling that he would fight the battle whole day and night but will never surrender. These extracts are the part of a famous rap song that was brought to the Nephop fans by the popular contemporary rapper “YamaBuddha” few years ago. This and many of his epic rap compositions will forever make the scene of Nepalese music lively but the rapper himself is no more living with us. It has truly been disheartening news that someone as optimistic as YB can commit suicide (no doubt the contradictory speculations on his mysterious death still persist). Let us take a dip into the emotional turmoil that this news had put YB’s fans like me into. Let us also unfasten few shackles that our society has attached to the suicides; for which few nuances of this problem have to be dealt with. For me, suicides bring a long history of painful memories and partially solved emotional riddles. This event has once again exposed my vulnerability in processing the news related to suicides of people with whom I feel connected to. It’s a sad story to share but in these past 5 years, 5 cases of suicides have shaken my mental well-being quite brutally. I have witnessed 3 suicides in my college hostel, another one of my student last year and this recent one which have given me the most recent shock. This time, I have realized that the new cases of suicides themselves are not the big challenges for me. The problem that I have recognized is the way I have handled my past mental upsets. When I went through cases of recurring suicides during my college, I forced myself to accept that nothing is so queer about students’ suicides as such suicides are quite common in India. Perhaps, the patriarchal mindset that commands every man to develop masculine attributes was also equally responsible for my artificial stone-heartedness during those days. Moreover, when someone popular as YamaBuddha who apparently didn’t have any reason to end his life, the million dollar question arises: why would anyone want to end his/her life in such a cheap way? What could be that one big factor that pushes everyone irrespective of their fame and wealth to the dark tunnel of death? I went through few of the stats about suicides both in the context of Nepal and in the world and the data was alarming. What I have found has put me in more dismay as Nepal stands at the 17th place for most male suicides (30.1 per 100,000) and at the 3rd place for most female suicides (20.0 per 100,000). According to another estimate of WHO, almost a million people in the world end their life each year which accounts to more than the gross loss of lives lost in the global conflicts. This bleak situation both inside Nepal and in the global arena is mostly attributed to depression which is believed to be one of the most feared killers of humans after couple of other chronic diseases. WHO also reports that 350 million people globally suffer from depression, and estimates that, by 2030, depression will be the leading cause of global burden of diseases. In this extended article, I therefore attempt to restate few of those old facts about suicide and depression. Below are few of the symptoms of depression which can trigger suicides or at least suicidal thoughts at some point in any individual. If these symptoms (not necessarily all of them) prevail in a person for more than 2 weeks then it’s possible that s/he is going through some depressive episodes. We might be going through these circumstances ourselves or may come across with some individuals who show these symptoms. The first and best remedy that one can offer is the emotional support. Avoiding lonely places and keeping oneself busy in one or other task will also help to an extent. But the ultimate support could be sought from the mental health professionals and one should not hesitate to reach out to these support centers. Gone are those days when society associated depression with the stigmas and mental illness as incurable result of some sins. If diagnosed and intervened in time, depression is just like other minor physical ailments and everyone can win the battle against it. This is the podcast of the radio program Manojigyasa which was originally broadcasted from Ujjyalo 90 Network. Manojigyasa is a program based on Psychology and Mental Health. This was originally broadcasted on September 10, 2016. We have presented the life and work of the legend of Psychology in Nepal , Prof Dr Ayan Bahadur Shrestha. A report on the current status of suicide in Nepal and the closing program of Hatemalo Program. This is the podcast of the radio program Manojigyasa which was originally broadcasted from Ujjyalo 90 Network. Manojigyasa is a program based on Psychology and Mental Health. This was originally broadcasted on July 16, 2016. We have Ashley Hagaman sharing her research on ‘Suicide Surveillance and Health System in Nepal: A qualitative research’ in our first part and then regarding ‘Sand Play therapy’ with Counselor Shristi Shresta in the second. We also have Psyhbigyaan Tip at the end. ”Manojigyasa” is the radio initiative of Psychbigyaan Newtwork Nepal which exclusively deals with the topic of Psychology and Mental Health. Our second episode went on air on November -28, 2015 (mangisr-12, 2072). To listen to our program live, you should listen to Ujyaalo 90 Network, Every Saturday from 5:15 PM. 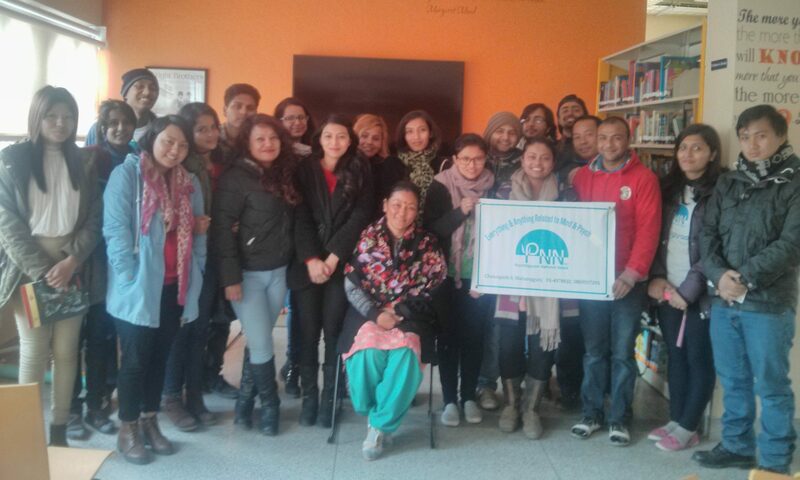 The program is prepared with the support from US Embassy Nepal, GPYC Nepal and Ujyaalo 90 Network. And the program is coordinated and presented by Kripa Sigdel and Sujan Shrestha.